Cassini! Checking my DNA now on the other side, yes that was my biological father. He had 165 I.Q, and worked on the very beginning stages of this space program in the early '50's. I often sleep with the t.v. on to stay out of my head thinking. So if I wake up with the news that Cassini made contact again, I will be sleeping at 3a.m. Because this is my week of yearly medical checks. Today was not so hot because the girl was so rude and said, you are very important. She acted like I should be in a nursing home or something. Then she hustled me so fast after saying I would be paying for the blood tests because Trump changed Medicare. So billing came in said I did not have to pay for anything. And the girl slapped all the devices on me to check pulse and blood pressure as riled as I was. But it was all normal. I enjoy your posts. This is all very interesting and amazing. How did you know about it - from the news on the net? Cassini is in the news because after 20 years the mission is going to be shut down due to lack of fuel. 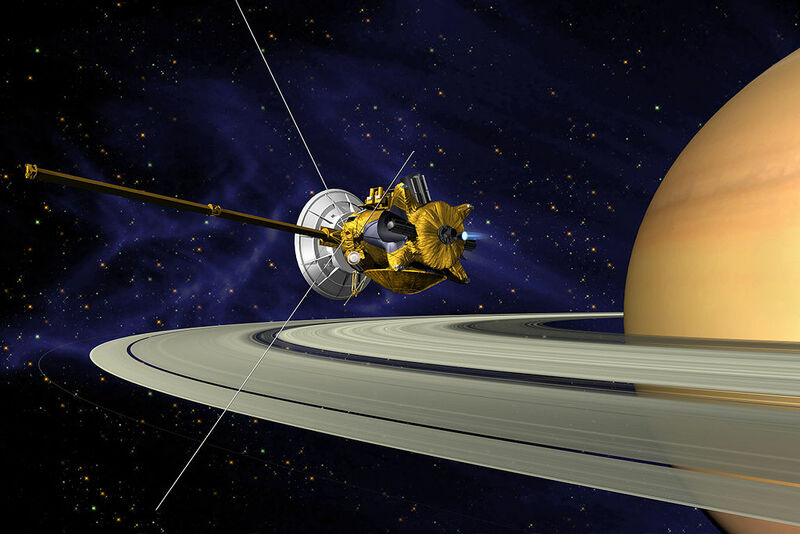 NASA is going to try 22 passes between Saturn and the rings then crash it into Saturn's atmosphere. The fact that they are able to do this with a spacecraft that is almost a billion miles away is beyond my DNA. Dang, that Meade LX90 takes one hell of a picture! and the firmament sheweth his handywork." Actually, Sam, Cassini and other forms of space exploration are made possible by OIL, not God. An advertisement by the American Petroleum Institute explained it to me last night on television. All kidding aside, I agree with JW that it is both wonderful and unfathomable that the human race can do such things. Having just read "Aurora" by Kim Stanley Robinson, I'm moved by a dreadful sense of poignancy that man is in the final stages of trying to get off planet Earth, having despoiled it to the point that even our big brains cannot remedy the forces now in motion. Too little too late. So let's marvel at what we DID do, and celebrate Cassini even as it goes down in flames. Pamit, sad to say, I had similar forebodings, but I still have hope. he calleth them all by their names." TY Sam. I like your postings today. Therefore there is no excuse for man to not honor God as the Creator. It is called willful ignorance.